Alison Shaffer: Win Purex plus Fabric Softener with Crystals Fragrance. Win Purex plus Fabric Softener with Crystals Fragrance. Just when you thought laundry detergent was at it's best, Purex® introduces Purex® plus Fabric Softener with Crystals® Fragrance. Yep, that's right Purex now has Crystals® Fragrance all in one bottle. That's a cost saver, Purex plus Fabric softener with Crystals Fragrance cost less than the leading brand saving you $45 a year. You don't have to buy fabric softener or dryer sheets anymore. Get clean clothes that smell fresh with the fragrance of Purex Crystals. I happen to love Purex Crystals added to my laundry with detergent, and you can still add them to this new formula for even more long-lasting freshness. To keep your clothes clean and bright DirtLift® Action in in Purex laundry detergent, it works deep into clothes to get the dirt out. I've been using Purex Crystals since they were introduced two years ago. My oldest daughter insists on Purex Crystals added to her laundry. The fragrance does last for a long time and smells wonderful. That's a great value. Enter Purex brand Sweepstakes. One grand prize winner will receive $1000 plus a year of FRee Pures detergent. 500 second place winners will receive a coupon for a FREE Purex Detergent. Head on over to Purex.com to enter today. CLOSED/Giveaway: Leave a comment on this post to win a coupon good for a FREE bottle of Purex® detergent plus Fabric Softener with Crystals® Fragrance.Two winners will be sent one coupon. Open to residents of CONUS. Comments will close on March 28, 2013 at 12 mid night EST. 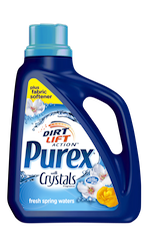 Disclosure: the Purex® brand provided me with a sample of Purex® detergent plus Fabric Softener with Crystals® Fragrance in exchange for a product review. The comments and views are my own. Would love to try this new product. Thanks for the chance! would love to try this! I'd love a chance to win. Thanks for another great giveaway Alison! I'd love to win, this sounds great! this sounds like a great new product that I would love to try. Alycia you won a FREE bottle, your comment was one of the random winners. congratulations! I really like Purex products, so I am looking forward to trying this new formula! Purex makes great products, I cant wait to try this one.